Manhattan Beach California is a notably beautiful and rather expensive oceanside city to live in. Some homes actually exceed $25 million! This idyllic location is located south of El Segundo and north of Hermosa Beach. Residents and non-residents alike enjoy the beautiful beaches here for it's surfing opportunities and beach volleyball courts. This city even hosts several tournaments for both sports. As can be common in some of the richer California locales, this city is a popular place to settle down for several notable celebrities. This is likely due to it's relative close proximity to Hollywood and downtown L.A.
History of Manhattan Beach: Settlement first started in the area in 1863 when a Scot named Sir Robert Burnett bought the area and then leased it to a Canadian named Daniel Freeman. As the area became a city, it was named after Manhattan in New York... "Beach" was added to avoid confusion in the postal system. 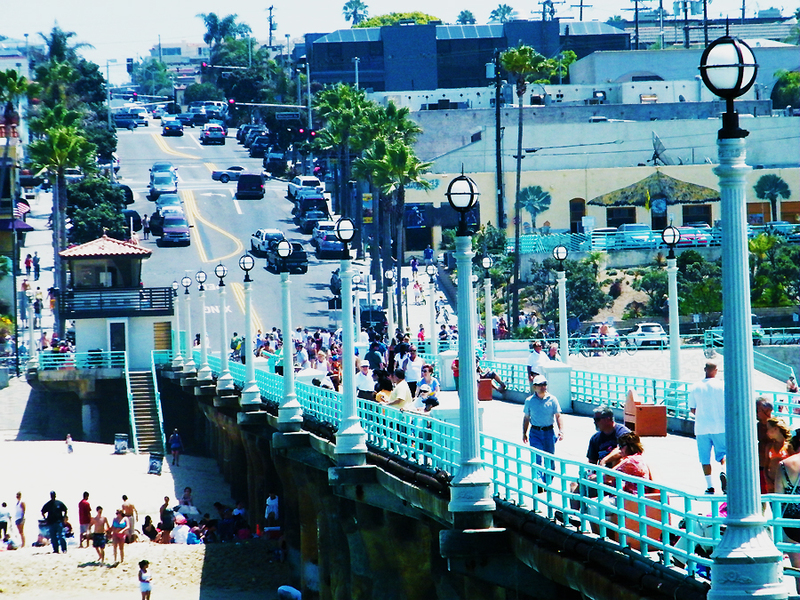 There is no doubt that Manhattan Beach is a rather fun area to spend time in. If you have the means, it's also a great place to live but, obviously, the price of entry can be rather steep. 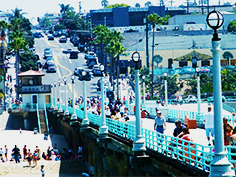 As such, we're here to tell you some of the finer places to go and see when you're visiting Manhattan Beach. The first thing that might be helpful is the understand the local's classifications of the different areas of the town. The neighborhoods are thusly coined: The Village, Hill Section, Tree Section, Gas Lamp Section, Sand Section, Manhattan Heights, East Manhattan Beach, Liberty Village, Poet's SEction, and El Porto. Hill Section and Sand Section are most notable amongst these. Downtown: The downtown area runs along the main boulevard and crossing streets from the Pier to Valley Drive. Here you'll find many of the finer dining establishments as well as a host of casual restaurants. There's also a great variety of souvenir and specialty stores, and a good amount of hotels. You'll also find a library downtown which offers internet access which could be useful for the traveler in the area. Rosecrans Strip:This area includes one of the more prominent shopping malls in the area, as well as the Manhattan Beach Country Club, the Marriott Hotel and Golf Course, Fry's electronics, and a good amount of restaurants, retail outlents, markets, and businesses. Sepulveda Strip: This is the area's main commercial zone and is also the main throughfare from the north to the south of the city. Not surprisingly you'll find mid sized hotels here, as well as some automotive related businesses, restaurants and "day to day" stores where one can find the necessities. Aviation Strip: Here is an interesting area that used to be home to the area's high school. Now you can find the Manhattan Beach Film Studios and the Northrop Grumman Space Park Complex there. These both make for interesting tours, when you can arrange one! Copyright ©2013 manhattanbeachbars.com | All Rights Reserved | Courtesy of Party Bus Los Angeles.